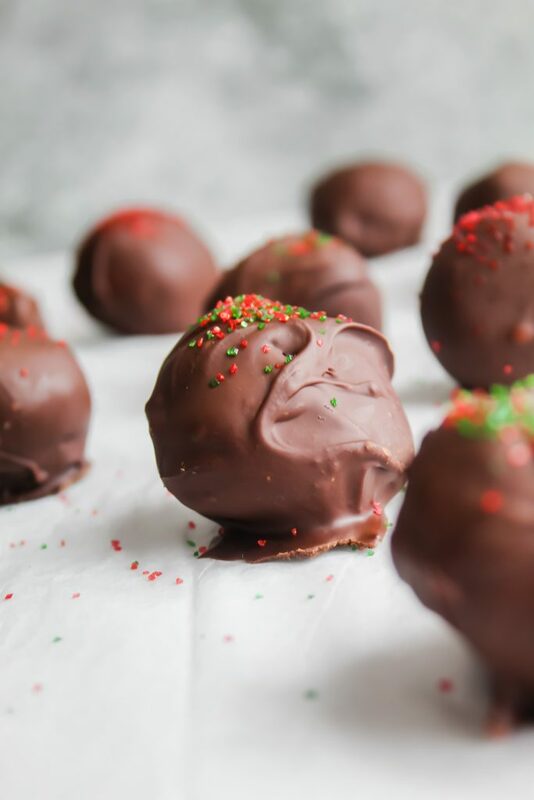 These Easy Oreo Truffles are my favorite Christmas treat! They’re amazingly fudgy, sweet and rich with Oreo flavor! Oreo anything is my weakness. Anytime we go out to eat and actually get dessert, if there is anything cookies + cream flavored on the menu, poor Ben just concedes – that’s the winner. If we go out for ice cream? Oreo, always. However, when November and December come around – all bets are off. It’s the ONE time of the year where I feel like everyone comes to a general consensus that calories don’t count. Do you want 3 plates at Thanksgiving and 2 pieces of pie? You do you. Or maybe you want to go to 3 different cookie exchange parties within the first week of December? No judgement here. It’s okay, right? It’s the holidays. This is the one magical time of the year where everyone seems to be happy and glowing and there are lights on every house and it just makes my heart happy. So I’m gonna eat whatever I want to, dang it! 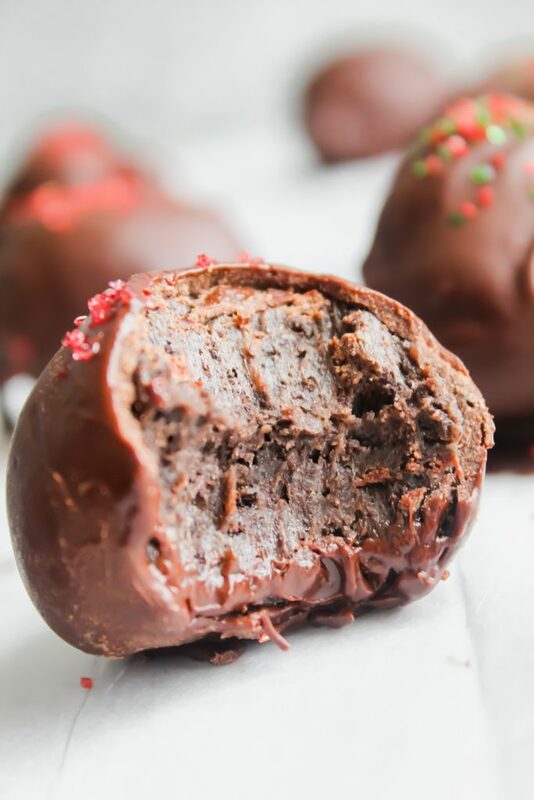 These Oreo truffles are my go-to recipe to bring to any Holiday party. They’re so delightfully creamy, rich and delicious! I love the combination of the cream cheese and Oreo. The slight tanginess of the cream cheese really helps balance out the sweetness of the cookie. These little balls of goodness are fudgy, sweet, rich, moist (you love that word don’t you?) and just delicious. Everytime I make them I want eat about 10. But they are so rich, you really can only eat a couple at a time. So I have to learn to pace myself. This is hard task though – when all I want to do is stuff my face with these precious Oreo gems. 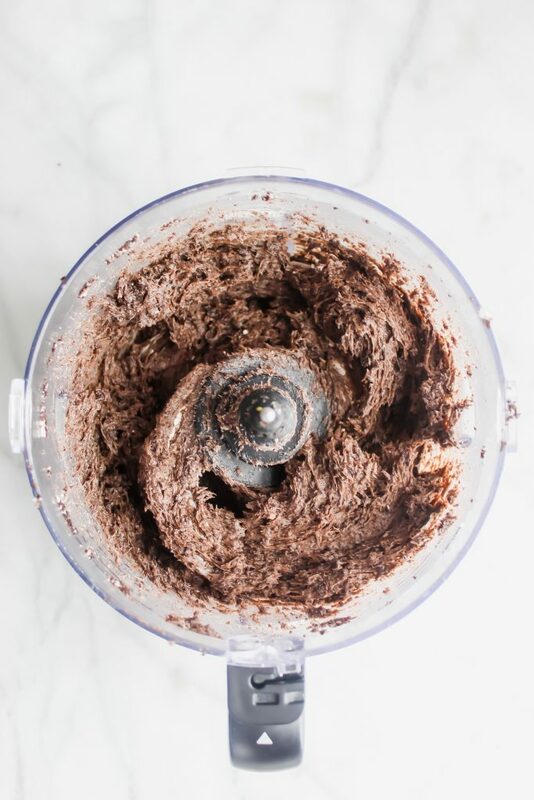 Oh, and it gets even worse during the process of making the truffles – and I have the entire food processor of dough just starting at me. It’s like it’s asking me to eat it. Of course, I’ll have a spoonful (or three). HOW CAN YOU RESIST DOUGH OF ANY KIND? Asking for a friend. 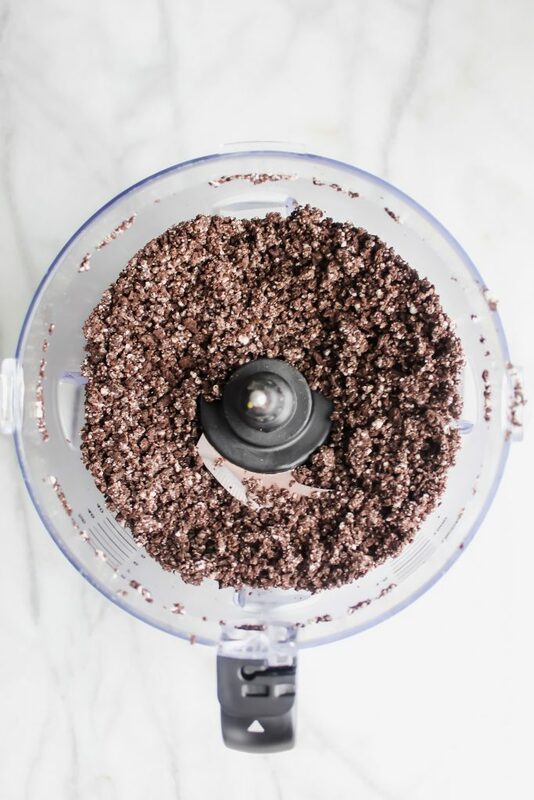 Step one: Place your Oreo’s into your food processor. Resist eating any. Okay, maybe just one. Step two: Pulse. Really, resist eating the crumbs. Okay, maybe just a spooonful. Step 3: Add in chunks of slightly softened cream cheese. Don’t you want to like, live in that delightful creamy oreo mixture? Me too. From there, it’s very simple. Roll them into balls using either your hand or a cookie scoop. Each one for me was about a tablespoon. Let ’em chill until they harden. Then, you dip them in melted chocolate because WHY NOT. It’s the holidays, right? As we discussed earlier, you can go all out and not feel one ounce of guilt. I used semi-sweet chocolate – but I think you could do bittersweet for this as well to cut down on the sweetness. 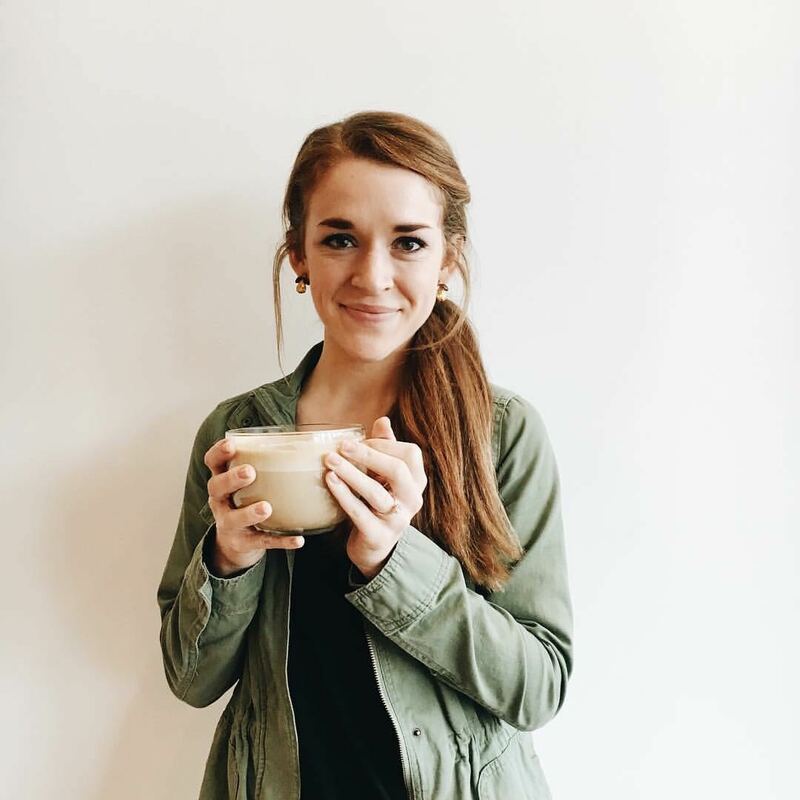 Find the full recipe below! Enjoy these – and especially enjoy the holiday season of treats! 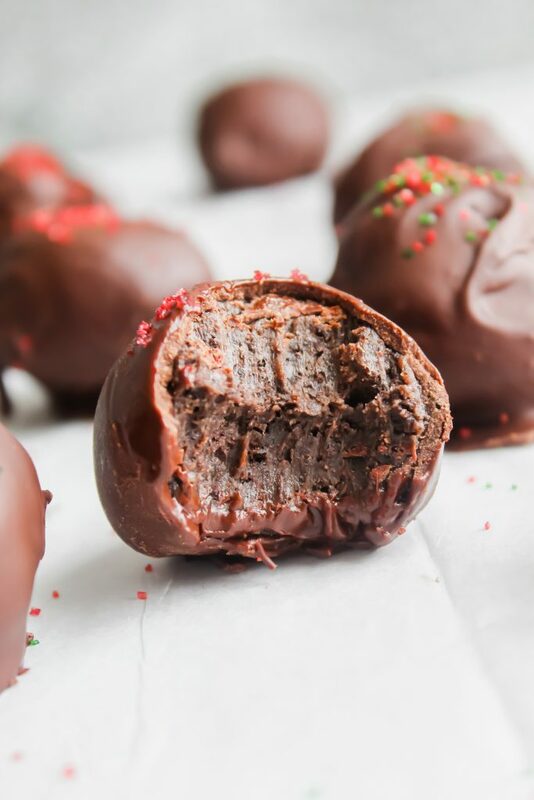 These Easy Oreo Truffles are my favorite Christmas treat! They're amazingly fudgy, sweet and rich with Oreo flavor! 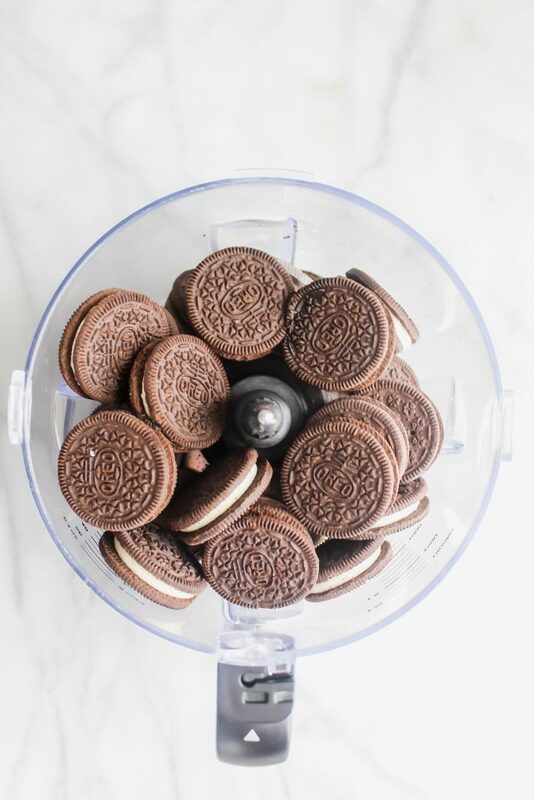 Add the entire box of oreos (minus a few for garnish) into the food processor. Pulse until coarse crumbs. 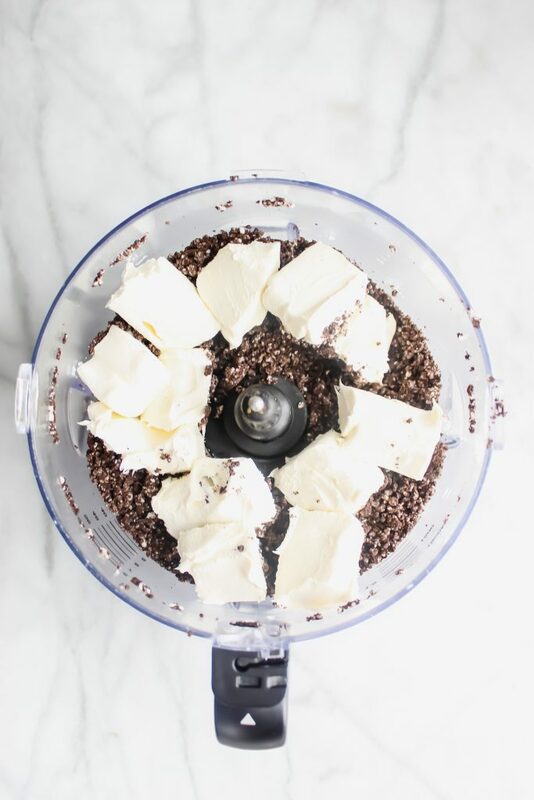 Chop the cream cheese into chunks and add to the food processor. Blend until mixed well. Using your hand or a cookie scoop, roll into small balls and place onto a large baking sheet. Yields around 20 truffles. Freeze about 1 hour, or until hardened. Using a double boiler or microwave, melt your semi-sweet chocolate chips. Add butter or coconut oil to help chocolate soften if needed. 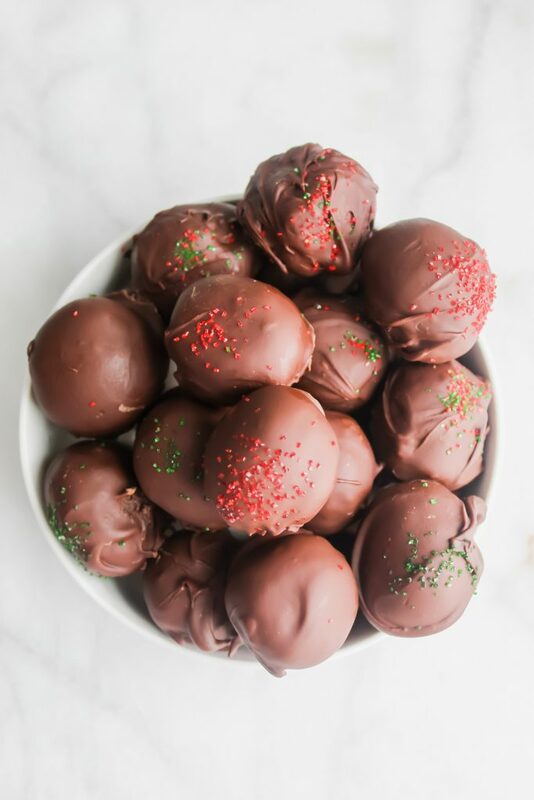 Dip the balls into the melted chocolate and coat them completely. Use a fork to let the excess chocolate run off the truffles. 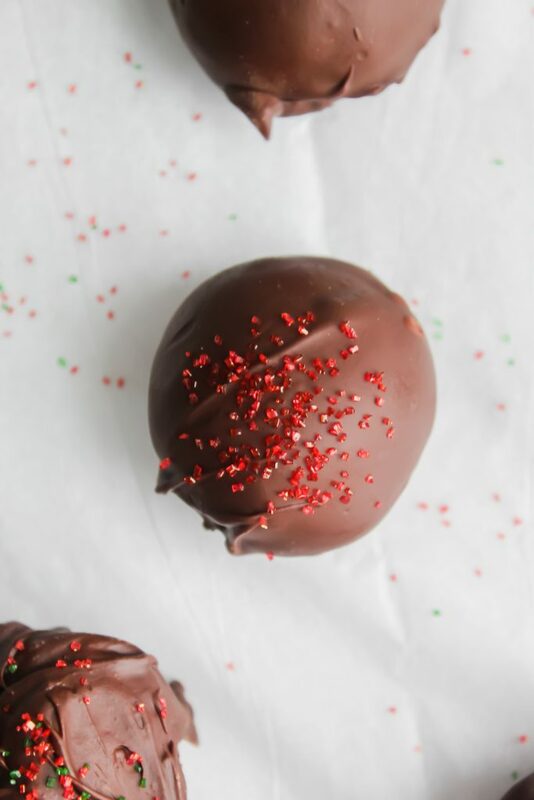 Place the oreo balls back on the baking sheet and add crushed oreos, crushed candy cane, sprinkles or nothing! Place back in the freezer until you're ready to eat! When ready, devour! These look ooey gooey good. I love chocolate. These are so YUMMY!!! And I basically have everything on hand to make ’em. I have hardly any baking done for the holidays ’cause I’ve been so busy with work and the blog, but these are totally do-able. Considering we have family coming this weekend for a get together I have to get on the ball and whip something sweet up ASAP. P.S. Calories don’t count on holidays, weekends or special occasions…just so ya know (that’s my story and I’m stickin’ to it 😉 ). These look decadently delicious Haylie! I love that they are easy and require only 3 ingredients. I rarely buy Oreos except around the holidays! I love to buy the mint ones and dip them in chocolate. I also like to make a white chocolate bark with Oreos and eggies! 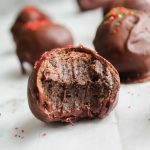 I’m thinking a version of these truffles definitely needs to happen this weekend! Thanks for sharing! Yum! Those mint Oreos dipped in chocolate sound fantastic! I’ll have to try that out this season! I also rarely buy Oreos…they’re just too tempting for me to eat! Thanks for the comment, Leanne! !